*Late-night budget talks between President Obama and congressional leaders failed to reach an agreement to avert a government shutdown. The President did report some progress after a hastily arranged late-evening meeting in the Oval Office with House Speaker John Boehner, a Republican, and Senate Majority Leader Harry Reid, a Democrat. 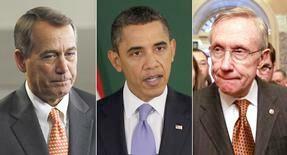 The budget deadlock threatens to shut down much of the federal government starting Saturday if a deal is not reached.